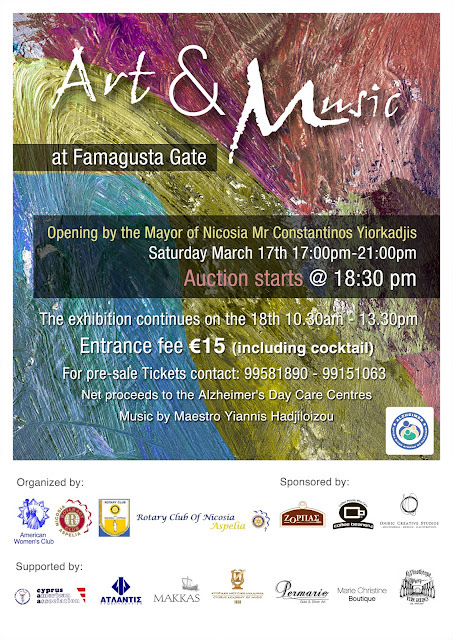 A charity event will be held at Famagusta Gate on Saturday, 17th March. This will comprise of an art exhibition, a small auction of paitnings, antiques and jewelleries donated by the participating artists and music, provided by well known maestro Yiannis Hadjiloizou. The event starts at 17.00 and the opening will be at 17.30 and will be performed by Mayor, Mr Constantinos Giorgadjis. Coffee, wine and snacks will be offered and the duration will be up to 21.00, whilst the auction will be at 18.30. Prices reflect the present economic climate and have been set to a maximum of 1200 euros for the most expensive pieces. Participating artists are Elisavetta Sivas, Roulla Mouzomenou, Marina Marathefti, Margarita Paraskevaidou, Kattya Glavina K, Hania Eghtesadi, Artemis Spyrou, Stalo Xinari, Myrna Konteatou and Hoda Mazloomian. Also, well known antique dealer Aristides L Coudounaris will be participating with a series of engravings depicting Greek islands, dated 1856. The exhibition will remain open also on the following day, Sunday 18 March, 10.30-13.30. All net proceeds will be donated to the Friends of Alzheimer Sufferers. The association supports the Alzheimer Day Care Centre in Kaimakli, on a regular annual basis. Entrance ticket will be 15 euros and it is hoped the event will attract not only art lovers but also persons sensitive to the problems of this affliction.